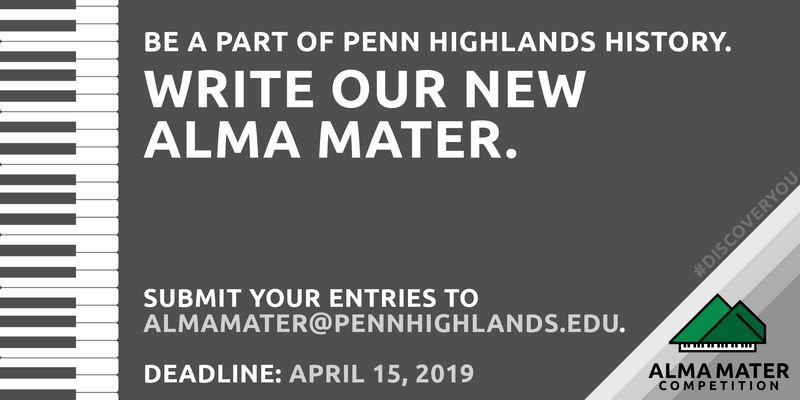 In honor of the College’s 25th Anniversary, to be observed during the 2019-2020 academic year, Penn Highlands is sponsoring a competition to select a new Alma Mater for the institution. The winner of the competition will receive a prize pack provided by the College’s Marketing & Communications Department! The winner will also be recognized at the 2019 convocation ceremony. All entries must be emailed to AlmaMater@pennhighlands.edu. Entries are due by April 15, 2019. See all Contest Rules below. Contest is open to all Pennsylvania Highlands students, staff, faculty, and alumni. Contest Committee members can participate but they will be excused from the deliberations and voting activities. The deadline for entries is April 15, 2019. No entries submitted after the deadline will be accepted or considered. Songs should not contain profanity or subjective/provocative language, should reflect the history and values of Penn Highlands, and project reverence and loyalty to the institution. Submissions must be the original works of the persons submitting the entries. Words and music that emulate, copy, or mimic other works will be discarded. Entries are permitted to use the current Alma Mater music. Feel free to lengthen or modify it, if desired. The link to the current music is here. Music that has been placed in the “Public Domain” can be used and submitted. Music is considered to be in the Public Domain if it meets any of the following criteria: All Rights have expired – published prior to 1924; the authors have explicitly put a work into the public domain; there were never any copyrights. If you use public domain music, you must source that music submission with the composer’s name and date of original publication. The Alma Mater Committee and Pennsylvania Highlands Community College Senate reserves the right to reject any and/or all submissions for any reason. Please adhere to the College’s Brand Guidelines with your submission. The winning submission will be recognized at the 2020 convocation ceremony. All questions can be emailed to AlmaMater@pennhighlands.edu. Any issues that may arise, which may not be addressed in these rules, will be reviewed by the Contest Committee on an as needed basis. You agree that you have followed the rules above and that your submissions are your original works. You agree that, by entering the contest, you irrevocably assign and transfer to Pennsylvania Highlands Community College all right, title, and interest in the lyrics and music in the song you are submitting for the contest including, without limitation, all copyright, and you agree to execute any additional documents that may deem necessary to evidence or effectuate such agreement. The Pennsylvania Highlands Community College rights with respect to entry include, but are not limited to: (a) the exclusive right to use, publish, display, record, reproduce and license/sublicense the song and lyrics submitted for any lawful purpose; (b) the exclusive right to alter, revise or change the entry in any way; (c) the exclusive right to secure copyright registrations and other rights in the entry anywhere throughout the world; (d) the exclusive right to license, exploit, assign, or otherwise dispose of the entry or any said rights included therein for any purpose which Pennsylvania Highlands may see fit; and e) any and all subsidiary rights in the entry. 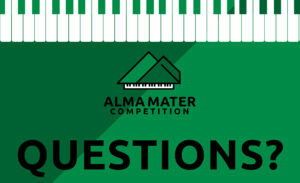 The Alma Mater Contest Committee will evaluate all submissions and select winners based on the rules and guidelines laid out for the competition. Judging will be based on the lyrics and the composition, not the musical abilities of the individuals submitting the song. The winning song may actually be played, recorded, and performed by others and not the song writer. The Alma Mater Committee will submit the top three entries to the College Senate for review and voting. The College Senate will choose one song for consideration and submit it to the College President. The Alma Mater Committee and Pennsylvania Highlands Community College Senate reserves the right to reject any and/or all submissions for any reason. What is an alma mater? Alma Mater is a Latin term that means “fostering or nourishing mother”. It typically refers to the college from which one graduated as well as to a song of praise for that institution. The lyrics often focus on the history of the school and the values associated with the College. It suggests reverence as well as loyalty to the school. Who can participate in the contest? All Pennsylvania Highlands students, alumni, faculty and staff. Contest Committee members can submit entries but they will be excluded from the deliberations and contest voting. When is the deadline? The deadline for submissions is April 15, 2019. How is the tune selected? The Alma Mater Committee will review all submissions and select the top three to submit to the College Senate for voting. The College Senate will recommend-suggest one to the College President. Will I hold copyright for my submission? No, but you will be credited for the song. Contest entrants agree that the winning song will become the property of Pennsylvania Highlands Community College. Can we use the melody or lyrics from another school or another song? All songs must be original in lyrics and melody. You may however use the music from the current Alma Mater and write your own words and/or extend/modify the music. You can also use music that is considered to be in the “Public Domain” as the copyrights have expired. If you use music where the copyright has expired, you will need to source your music submission with name of the composer and date of original publication. Can I get help with my submission from outside sources? Yes – you can enlist anyone you would like to help you with your submission. Credit for the song will be given to the Student, Staff, Faculty Member or Alumni who submits the work. Keep in mind that all submissions become the property of Pennsylvania Highlands Community College. Will my voice or musical talents be considered in the judging? No, judging will be based on the composition and lyrics, not your singing or musical abilities. Your voice (singing) and music performance will most likely not be used in the final official version. Send us an email at almamater@pennhighlands.edu.